We help clients achieve their goals by providing high quality printing by skilled craftsman who have your best interests in mind. 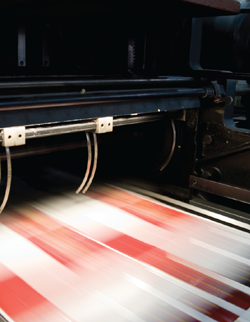 We are dedicated experts in the digital and conventional printing industry and we utilize our resourcefulness to develop clever ways to overcome obstacles, meet tight deadlines and earn your confidence. These traits didn’t grow overnight, they were born from over 100 years of experience. With the spiraling costs and challenges of marketing today, these are important qualities. With old fashioned values and today’s technologies, Winchester Printers is the wise choice. We may not have our heads on a swivel, but you can rest assured that our experienced teams of professionals are keeping our eyes on your project from start to completion. At Winchester Printers, you’re not just another customer – you’re our partner and we hold a vested interest in your success. A newspaper publisher/editor, George F. Norton, and Thomas M. Hiltzheimer established the company that in time would become known as Winchester Printers. Back then, The George F. Norton Publishing Company offered commercial printing, embossing, engraving high class stationery, blank books, office art, and school supplies. In 1929, the company became known as Winchester Printers and Stationers, Inc. This year saw another name change, to Pifer Printing and Stationery. The company split into two entities: Pifer Printing + Pifer Office Supply. The company moved to its long-time former location at 116 North Braddock Street. Five years later, another name change brought the company to its present name, Winchester Printers, Inc., under the leadership of the Hottle family. As the graphics industry has evolved to its present hi-tech state, we have endeavored to upgrade our equipment and facilities to stay on the leading edge. In 2000, we built our current 25,000 square foot plant on five acres just east of Winchester, allowing space for updated equipment and future expansion. These are exciting times for Winchester Printers! Our logo has undergone a transformation, but our mission remains the same. Many owl species have asymmetrical ears. These are different sizes and different heights on their heads. This gives the birds superior hearing and the ability to pinpoint where prey is located, even if they can’t see it. Our team cares about what you have to say. Calvin Coolidge said, “It takes a great man to be a good listener.” This trait helps us see beyond your immediate need and allows us to advise you in ways to gain more from your marketing investment. Our prepress department is where your job begins. Our automated workflow allows us to take your job from proof to production quickly and accurately. 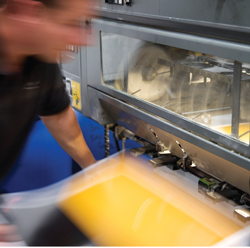 Our digital proofers are fingerprinted to our presses and all our presses are connected to our workflow which allows us to produce consistent and accurate color. With our full range of sheet fed presses, we can match your job with the best equipment to give you the most economical and efficient process. Our console driven, highly automated presses combined with the best operators in the business will give you the results you demand. Without our finishing department, your job would never be complete. Our wide range of equipment will provide you with the folding and binding options you need. Are you looking for something out of the ordinary? We have the solutions for all your needs. Let us make your printing stand out above the rest. 26″ x 40″ continuous feed 16-page MBO folder with gatefold attachment. (3) 20″ x 28″ pile-fed 8-page MBO folder. (2) 45″ programmable guillotine cutters with paper handling capabilities. Heidelberg Stitchmaster ST100 8 pocket plus cover feeder saddle stitcher with Rima automatic stacker. Capable of speeds up to 9,200 books per hour. Various small bindery equipment used for perforating, collating, gluing, stitching, drilling, etc. Direct mail is the most effective way for you to reach your targeted audience. E-mail and social media cannot compete with marketing your customer can hold in their hand. Join the list of satisfied customers who have discovered the convenience of a printer and mail shop under one roof. Our digital offering is not just “color copies”. With our extensive knowledge and experience, we can fulfill simple short run static printing up to complicated variable data projects. Our software allows us to not only utilize variable data but also variable imagery. Our digital department has allowed us to become extremely flexible in today’s demanding environment. Our customers asked and we delivered. Our 4 color plus white ink hybrid UV machine can print on almost any rigid or flexible material up to 1.82” thick. Pair this technology with a skilled prepress department and you have an unbeatable signage solution. FACT: THE PAPER INDUSTRY PLANTS THREE TIMES MORE TREES THAN IT CUTS. THERE ARE A LOT OF INTERESTS COMPETING FOR MARKETING DOLLARS TODAY. AS A RESULT, THE MYTH OF PRINT NOT BEING ENVIRONMENTALLY FRIENDLY HAS BEEN VERY WELL PROMOTED. THE PRINT INDUSTRY, IN FACT, IS NOT ONLY ENVIRONMENTALLY FRIENDLY BUT IS ONE OF THE MOST SUSTAINABLE INDUSTRIES AROUND. THE INDUSTRY MAKES TREMENDOUS INVESTMENTS IN APPLYING RENEWABLE ENERGY SOURCES AND CREATING ENVIRONMENTALLY FRIENDLY SUPPLIES. Come visit us at our plant in the Westview Business Centre. We are located just two miles from the I-81 / US-50 interchange in Winchester. Our office hours are 8:00 am to 5:00 pm Monday through Friday. Copyright 2016 Winchester Printers, Inc.